Non-medicinal ingredients: cassava dextrin, ascorbyl palmitate, sodium stearyl fumarate. Capsule: hypromellose. 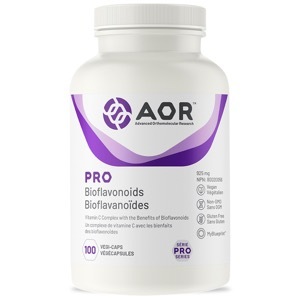 AOR's Pro Bioflavonoids provide the benefits of vitamin C, with an extra punch. Bioflavonoids are powerful antioxidants in their own right, they are even more powerful when combined with vitamin C. Pro Bioflavonoids are ideal for use by anyone who wants to improve their antioxidant defenses and boost their overall health. Flavonoids recharge and enhance the activity of other antioxidants, including vitamin C. This formula fights against inflammation, promotes healthy cell division, and benefits cardiovascular and skeletal health. AOR provides a high dose of vitamin C enhanced with bioflavonoids, creating a more effective supplement, replicating the way nature intended it.